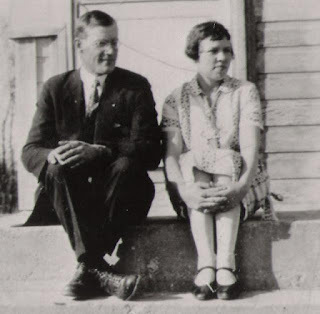 Today marks the 112th anniversary of my maternal grandma's birth - Frances Jeannie Milne Kinnaird. My previous blog post about her was written over 3 years ago and since then I've been able to scan many more great pictures of her that I'd like to share today. 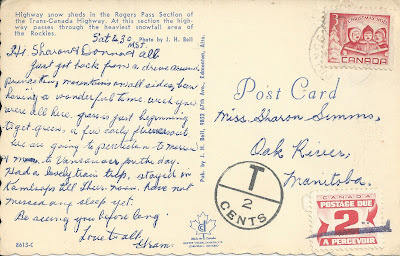 Cousin Karen has invited us to supper tonight along with Frances and Frank Kinnaird's daughters Marjorie and Margaret (my Mom) to share memories and I'll take this blog post along. 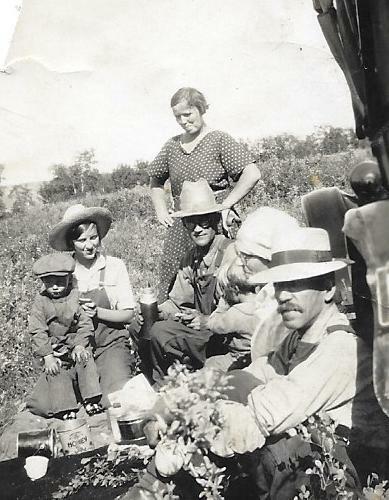 The first above picture is of Frances in the back with her two younger brothers Charlie born in 1913 and Jim born in 1910. 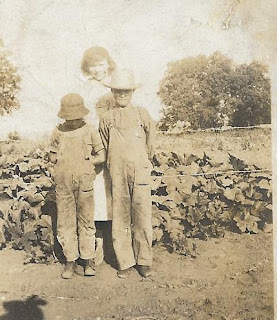 That would date this picture of them posing in a pumpkin patch to about 1918 perhaps. The picture on the right is a young Mr. and Mrs. Kinnaird shortly after their wedding in 1927. I have never seen any pictures of their wedding day, maybe there are some out there in someone's album? 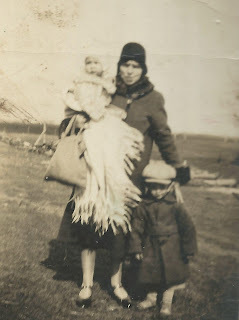 This one of a young mother Frances carrying Marjorie wrapped in a shawl and with her hand on son Keith's shoulder is a favourite of mine. Looks like Keith is wearing the same hat later that summer while saskatoon picking near Miniota in the next picture. 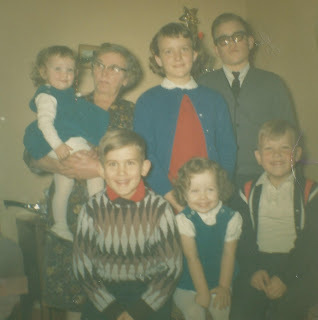 He is sitting on his Aunt Nan Milne's knee, Frank is next with the glasses, then Marjorie on Jane Milne's knee and Alex Milne on the end with the moustache. Grandma was known to avoid the camera but I love this picture of her with her hands on her hips! 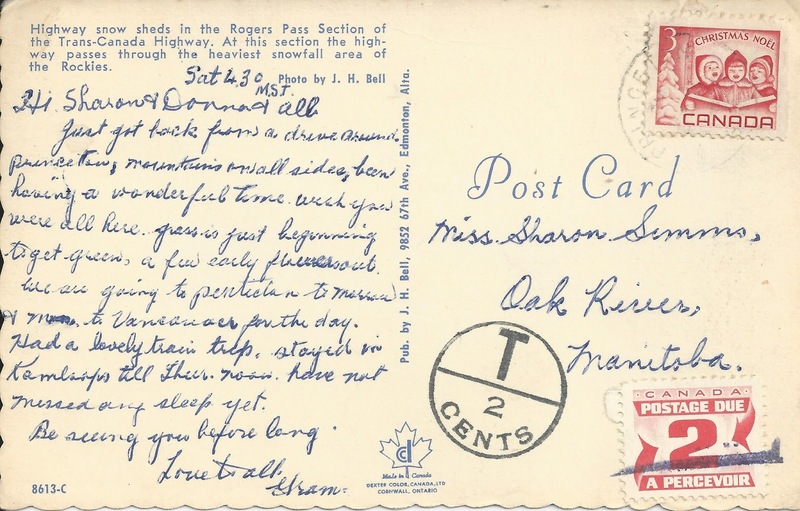 These photos would both be from 1931, I'd guess. 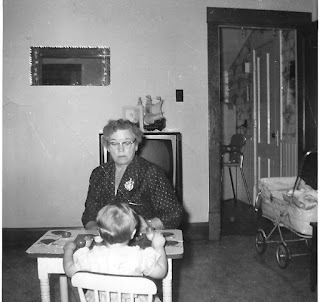 Grandma is having a tea party with her granddaughter Dolores Tapp in 1960 and maybe baby Karen is in the buggy? Christmas 1965 was the occasion of the colour picture of Frances with her Simms and Kinnaird grandchildren and she is holding me!